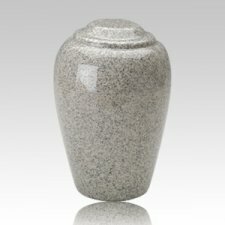 The Grecian Mist Gray Granite Cremation Urn is made from cultured granite material. The urn can be displayed at home or at the mausoleum. This cremation urn is made for burial as well and can be used as an urn vault for the cemetery or any other place. Create a peaceful resting place for eternity. A Beautiful Classic Style Cremation Urn. The Urn can be engraved on the Lid. You can select if you like the urn laser etched with name and dates in 4 different colors (please take the urn color in consideration when selecting the text color). "Incredible value for the price. So much heavier than I expected."